Amelia Island accommodators are providing visitors with many eco-friendly options including green lodging, complimentary bikes and more. Eco-minded visitors to the northeast Florida coast can now reduce their carbon footprints with a number of offers at some of the most luxurious Amelia Island hotels, resorts and inns. At just 13 miles long and two miles wide, Amelia Island offers a big Florida beach vacation adventure in one small package -- perfect for 'green' travelers who want to put it in park and save some gas. The Florida Department of Environmental Protection (DEP) recently awarded the sprawling Amelia Island Plantation its Green Lodging destination certification making it the first accommodator on the island to earn this coveted designation. The Plantation offers a resort-wide recycling program, which includes glass, plastic, aluminum and newspapers, plus electronics. The resort also shows its commitment to being 'green' through its use of automatic and low flush water fixtures in guest and public restrooms, resort-wide low energy and long lasting fluorescent lighting, the Project Planet linen and towel re-use program, and clean and green pest control and housekeeping products, as well as many other initiatives. Guests visiting the Plantation this fall can also expect to save some green in their wallets thanks to lower off season rates. The Ritz-Carlton, Amelia Island recently launched Give Back Getaways, a unique voluntourism program that allows guests to spend a portion of their vacation making a positive impact on the lives of others. During the half-day "Growing Green" experience, visitors will share their love of nature with the Boys & Girls Clubs of Nassau County, helping them expand their garden plot and build a compost area for a fresh crop of flowers, trees and organic vegetables. No green thumb? No problem. Guests will put up some gardening tips of the their own as together they learn the basic disciplines of planting, growing and harvesting an environmentally sustainable garden. "Growing Green" will be offered on September 26, October 24 and November 21, 2008. Several of the island's renowned bed and breakfast inns are offering guests complimentary use of rental bicycles during their stay. The Ash Street Inn, Addison on Amelia, Hoyt House and Fairbanks House are all giving guests this special chance to "park it" during their stay. The Florida House Inn goes one step further by offering guests complimentary use of energy-saving motor scooters. Several of the island's inns are located in or near the Historic District of Fernandina Beach, which offers an array of dining, shopping and activities. 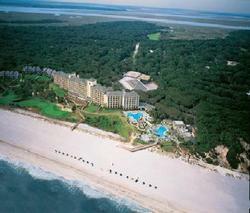 Guests at the Amelia Island Plantation can rent bicycles and motorized golf carts for use on the 1350-acre property, and can take the resort shuttle to downtown Fernandina Beach (adults $16, children 12 and under are free). As an eco-friendly addition to any Florida island vacation, the Amelia Hotel at the Beach also rents scooters, bikes, and Electric Gem Cars to guests. Many Amelia Island resorts, hotels and inns have also recently created special packages to ease the pain of high gas prices for visitors. The Elizabeth Pointe Lodge, an oceanfront bed and breakfast inn, is offering a 'Park & Petal' Package*, which includes a three-night stay, daily buffet breakfast, a picnic lunch for two each day, and a daily bike rental. The Hampton Inn, Amelia Island is offering guests a 'We'll Fuel Your Fun' Package*, which includes a two-night stay and a $50 gas card. *Both packages are based on availability and subject to restrictions by the accommodation. The "We'll Fuel Your Fun" package ends on September 30, 2008. About Amelia Island: Located just off Florida's northeastern coastline, Amelia Island is a barrier island rich in colorful history and breath-taking natural beauty. Its long, beautiful beaches, abundant wildlife, and pristine waters have made the island a favorite destination for outdoor adventure. Upscale resorts with world-class spas, championship golf and exclusive dining blend effortlessly with a captivating collection of bed and breakfast inns and historic districts. The island is home to Fernandina Beach, once a vibrant Victorian seaport village, and now a charming downtown district of eclectic shops, attractions, and eateries.